Sometimes, the best areas to ride, are not the formal trail systems in the region. Summer beach rides are a blissful way to go for a ride. Generally winds are lower in the summer so it is easy to cruise along the water line in the damp firm sand. If you start getting hot, either steer your fat bike into the water to get a nice spray of cool water or stop and take a dip. You can easily start from several beach access points along the Lake Michigan shoreline where you will have miles and miles of beach to ride. Beach access for fat bikes is not allowed in some areas so please be aware of local regulations and avoid congested areas. Starting in Manistee at 5th Avenue Beach and going north to the Bar Lake Beach opening is a premier section because you will ride traditional beach/dune sections as well as areas bordered by bluffs and springs. If riding during the middle of the day in the summer, be prepared and mindful of pedestrians and beach-goers on this route because you will pass through several popular beach areas. If you are only in the area for a day or along weekend, these are the must ride trails, and you won’t be disappointed. Big-M Recreation Area (located off M-55) is an awesome place to ride 365 days a year and when you combine the cross-country ski trails in the winter, you have an ideal place for outdoor adventurers. “Outer Loop” is a groomed signel track with three varied difficulty levels.. Beginner to the Fat Tire movement should stick to Swedish Fiddle and Bindle Stiff to the East. An intermediate out and back can be found along Gabriel’s Horn and Shanty Boy, but note that when you hit the varied terrain and switch backs as you continue west, you are getting into some pretty difficult terrain the rest of the way around the complete loop. Please respect the “no bike” rule on the groomed ski trails. In the “spring” when they stop grooming the ski trails is the best time to fat bike the entire trail network which makes up nearly 45 miles of trail opportunities. The Arcadia Dunes Trail Systems are another great place to ride. The St. Pierre Trailhead provides direct access to the Dry Hill, Chestnut and Camp Trail Loops just north of Arcadia on the east side of M-22. The single track is a perfect beginner to intermediate ride. 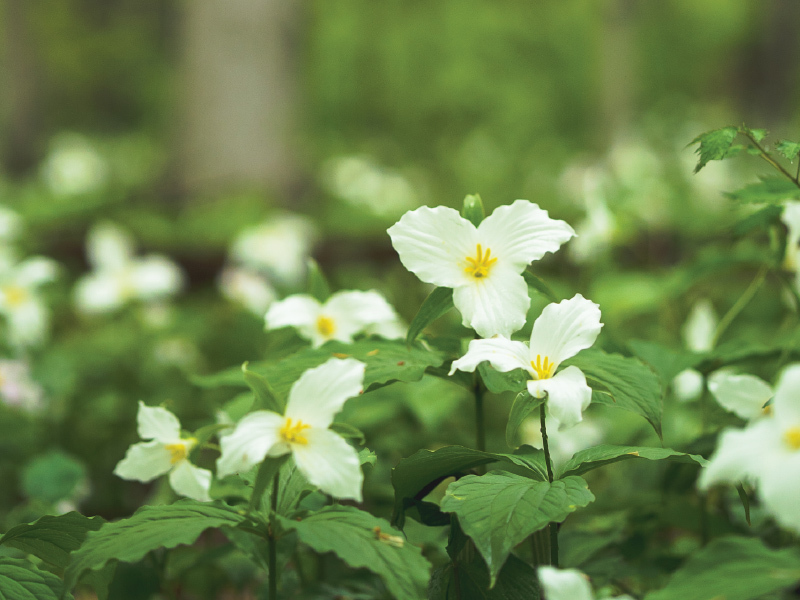 Spring is an incredible time of year to visit as the Trilliums are in full bloom making for a spectacular scene as you traverse the undulating terrain – see map on the following page. 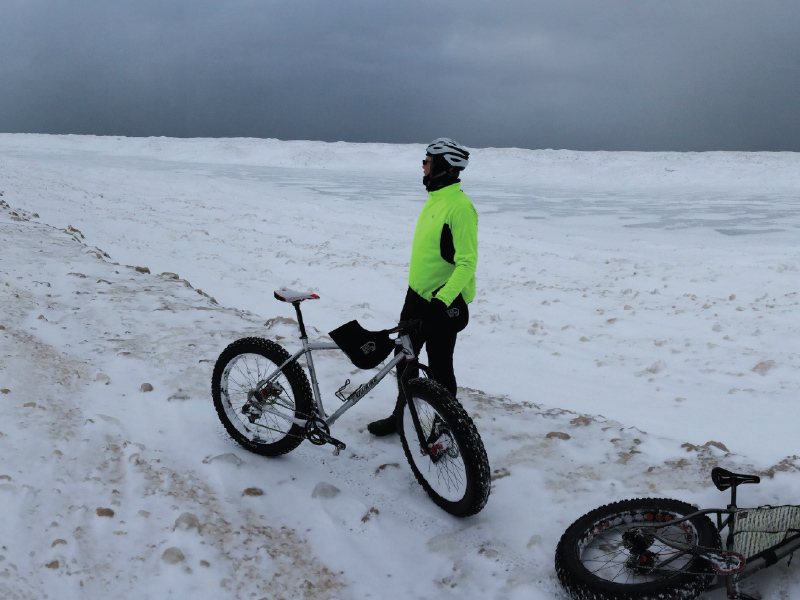 Just across the road, the Old Baldy Trails are also great for riding with direct access to the Lake Michigan Shoreline. For a more singletrack type experience, venture onto the extensive network of un-groomed snowmobile trails in the area. All it takes is a couple snowmobiles to compact the snow and this creates great fat biking in the winter. 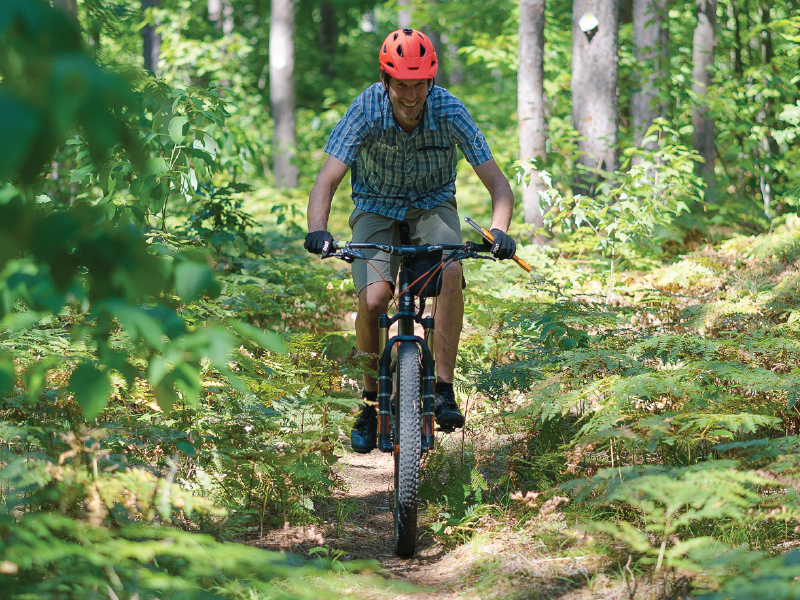 Nestled in the Manistee National Forest you will find hundreds of miles of marked trails for those who love to hike, bike, or in the winter, cross country ski and snowshoe. Which trail should you choose for your weekend adventure? This perfect weekend hike offers a varied and dynamic perspective of the natural beauty of Manistee County. The North Country Trail and Manistee River Trail loop is approximately 20 miles and is ideal for a relaxing hike with a group of friends or family who want to “rough it” for a weekend getaway. With many access points to the trails, starting out at the Upper River Trailhead just off of Coates Highway is a great spot to begin. It is typically less crowded during the summer months compared to nearby Red Bridge, or Seaton Creek Campground to the north. If an entire weekend on the trail loop isn’t your cup of tea, try these perfect day hikes. Starting at Red Bridge, you can venture onto the Manistee River Trail and head up the Slagle Creek. The scenic overlook is spectacular. The best part, the views and terrain are quite varied, so this out and back (which should take you about 2-4 hours) is a great way to experience a lot without needing to go on other trail systems. This segment is fairly difficult, so we only recommend experienced hikers. 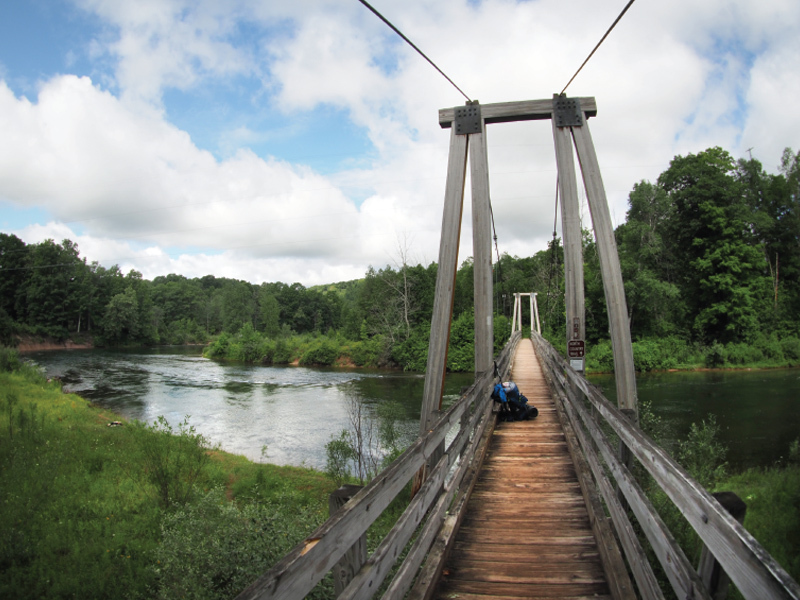 For a more easy going trail hike, start at the Suspension Bridge Parking Area (at the northern most segment of the Manistee River Trail system) The hike to the suspension bridge is short and you are rewarded with great views of the river and surrounding area. Continue along the trail until reaching the small waterfall and turn around and head back. This is an easier segment to tackle over the southern sections, and is more family friendly, but you will still need to traverse some intermediate terrain. The Old Baldy universally accessible trail is perfect for families and casual hikers. Completed in 2018, the trail is perfect for a quick couple hour out and back trek. The panoramic views of Lake Michigan at tne end of the trail are a perfect way to start or end your vacation. The accessible trail isn’t the only loop as part of the Old Baldy Trail system. There are various loops ranging from 2-4 miles, and at the northern most tip of the trails you will find the Old Baldy Trail, with rolling dunes out to Lake Michigan (this trail is our featured photo on the cover of this guide). If you are strapped for time, but still want to get out and enjoy the fresh air, Magoon Creek and the trails at Orchard Beach State Park are perfect for the families and first timers. Both trail systems are within 10 minutes of Downtown Manistee and their various loops make it easy to spend just an hour on the trail, or half the day. First timers, or seasoned pro’s – no matter your skill level we have a trail for you. Our trail systems are very well marked, so you can hike and bike with confidence. We also have a lot of great online resources available on our website at: VisitManisteeCounty.com. See you on the trails!